In a saucepan, boil coconut milk, rice, salt, sugar and cardamom. Reduce heat and simmer for 25-35 minutes, stirring occasionally. Remove from heat and let cool until just warm. 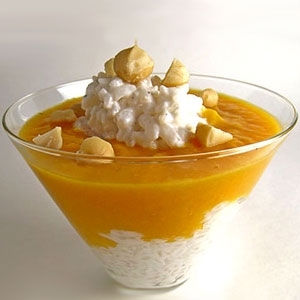 Place large tablespoons of rice into a cup or plate and top with mango puree. Finish with mango slices and serve.